The Metals in Medals and How to Clean Them This Memorial Day - Dalton & Co. There are lots and lots of medals awarded by the U.S. Military. From service crosses to stars to medals for heroism both in combat and support, and achievements in various theaters of action and campaigns, military families have a lot to polish up this month. But how? Is this one of those things people tend to overthink, and it’s fine to just take a toothbrush to these precious service awards or just run them through the dishwasher? Medals are made from a variety of metals. This even applies to the same kind of medal over time. Take the Purple Heart, for example. Awarded for suffering wounds in combat, this medal is made from “gilding metal” today, a mostly copper alloy. 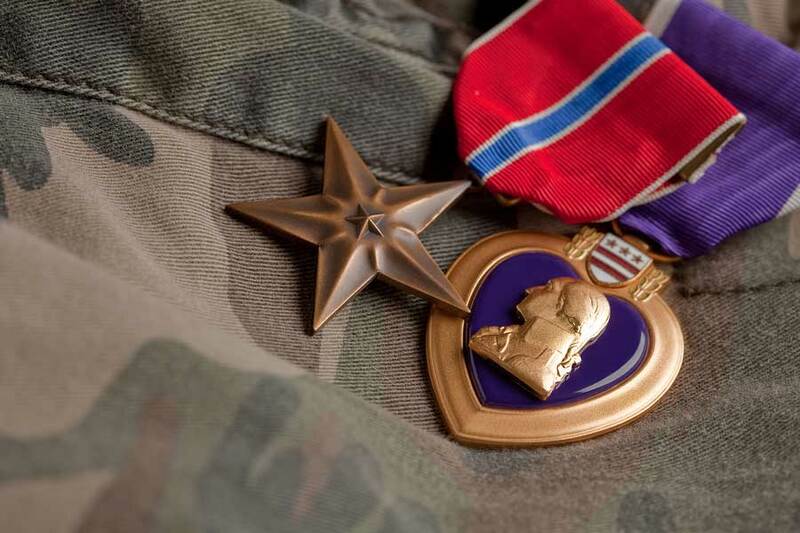 Early Purple Hearts from the ‘30s and early ‘40s were made from bronze (Army) or sterling silver (Navy & Marines). Copper, bronze and silver have different tolerances for abrasiveness. The softest of these is silver, so when in doubt, assume you’re dealing with silver and take it easy on the goods. Memorial Day is a good time to clean medals because it means you’re only doing it once a year. If you clean them too frequently, even just handle them too often, you’ll cause unnecessary damage. Remove ribbons. As these are also a precious part of this treasured heirloom, you want to avoid getting polish on them. If you can’t remove the ribbons, just be careful. Use a soft cloth to apply silver cleaner. Rub gently. Clean crevices with a cotton swab and buff the surface with a soft cloth polish or cleaner is removed. The most important thing to remember is to avoid extremes of temperature, humidity and light. Damp conditions can cause metal to corrode or tarnish. Heat and a very dry environment makes the ribbon fabric brittle. Soft cotton and linen sheets are good materials for wrapping your medals. Other fabrics, like velvet, have dyes in them that encourage corrosion. It’s also a good idea to stick to acid-free tissue paper and cardboard. Here are a few fun holiday activities, including a couple of events right here in the city Dalton & Co. calls home, Muncie, Indiana! From all of us, have a happy, safe and meaningful Memorial Day. Free admission to our nation’s active duty military personnel, including the National Guard and Reserve, and their families from Memorial Day to Labor Day. Arts & crafts vendors, food vendors, games and free live musical performances. Fly what you bring! Open to all RC aircraft, gas, electric, or turbine. $30 pilot fee donated to AMA brick in memory of Darrell “Big D” Bell with additional going to Camp AMA. Camping available. The public is invited to support the Allen County Council of Veterans during the annual Memorial Day Parade and Ceremony. The Service will include the joint service color guard presentation of colors and performances by the Capital City Chorus and the Indiana National Guard’s 38th Infantry Division Band.